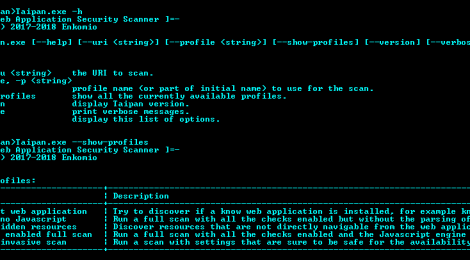 Browse: Home / Taipan – Web Application Security Scanner. Taipan is a an automated web application scanner which allows to identify web vulnerabilities in an automatic fashion. This project is the core engine of a broader project which include other components, like a web dashboard where you can manage your scan or download a PDF report and a scanner agent to run on specific host. + Web Application fingerprinter: it inspects the given application in order to identify if it is a COTS application. If so, it extracts the identified version. + Hidden Resource Discovery: this component scans the application in order to identify resources that are not directly navigable or that shouldn’t be accessed, like secret pages or test pages. + Crawler: This component navigates the web site in order to provide to the other components a list of pages to analyze. It allows to mutate the request in order to find not so common pathes. + Vulnerability Scanner: this component probes the web application and tries to identify possible vulnerabilities. It is composed of various AddOn in order to easily expand its Knowledge Base. ← Many-Eyes is a data collector that can be used for threat-hunting and data collection.